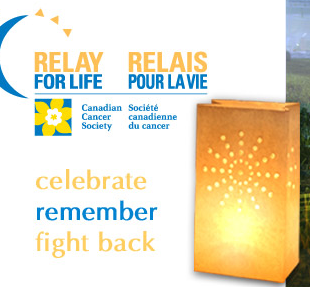 The Canadian Cancer Society: Relay For Life is much more than just a fundraiser. It is an opportunity to get together with family and friends and celebrate cancer survivors, remember loved ones lost to cancer, and fight back in the hope of finding a cure for this terrible disease. This year Relay For Life is embarking on its 10th year here in Peterborough. It takes place June 3rd and 4th from 7 p.m. to 7 a.m. at Rhema Christian School, and the public is invited to come out to the track and watch the relay, and show their support for all the teams participating. It starts Friday evening, and is a 12-hour event. Organizers hope to raise about $200,000. This year, Peterborough's David Di Bella will be carrying the "Remember Flag" with his kids Kaitlin and Lukas as part of the opening ceremonies Friday evening. Dave's wife Kristen lost her battle with cancer, but Dave and his family are carrying on the fight. They will be on the stage for opening ceremonies, and the announcers will be reading a short note Dave prepared for the event.